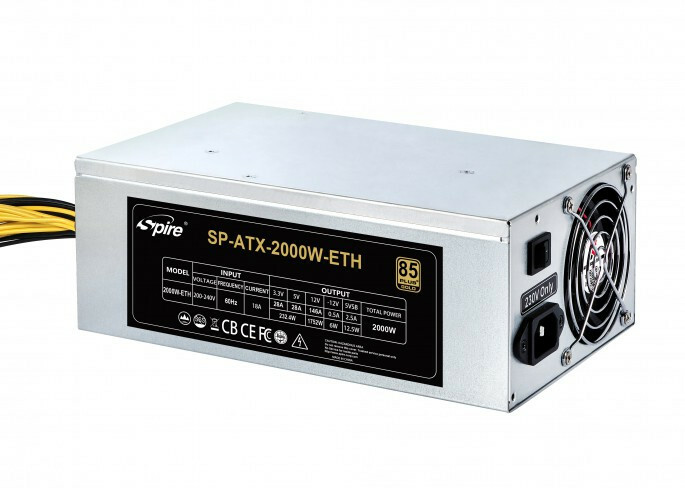 Spire rolled out the SP-ATX-2000W-BTC/ETH, an ATX/PS2 power-supply for GPU-based crypto-currency mining rigs. 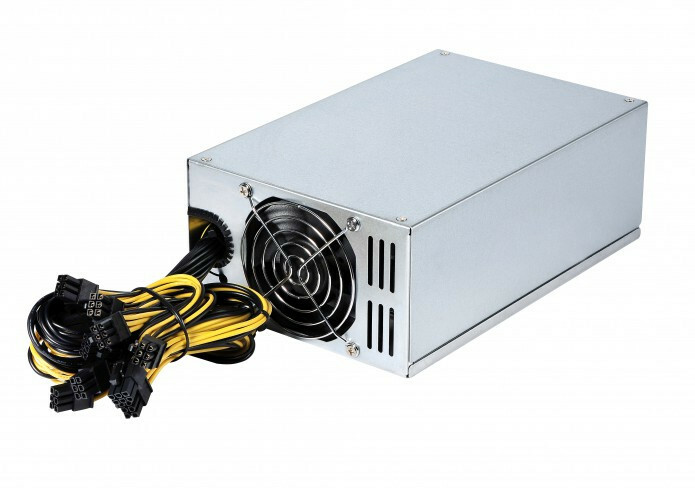 With 2000W power on tap, the PSU bears a no-frills design to keep costs low. The design focus is not just on the number of PCIe power connectors, but also the length of the PCIe power cables, so you can have a multitude of graphics cards popping out through risers. 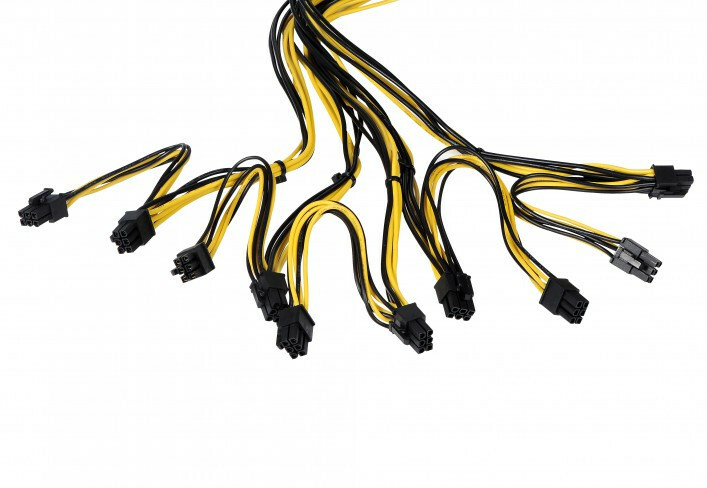 The PSU comes with a total of eighteen PCIe power connectors, of which ten are 6-pin, and eight 6+2 pin. You also get a surprisingly high thirteen SATA power connectors, a 4+4 pin EPS, and a 24-pin ATX. 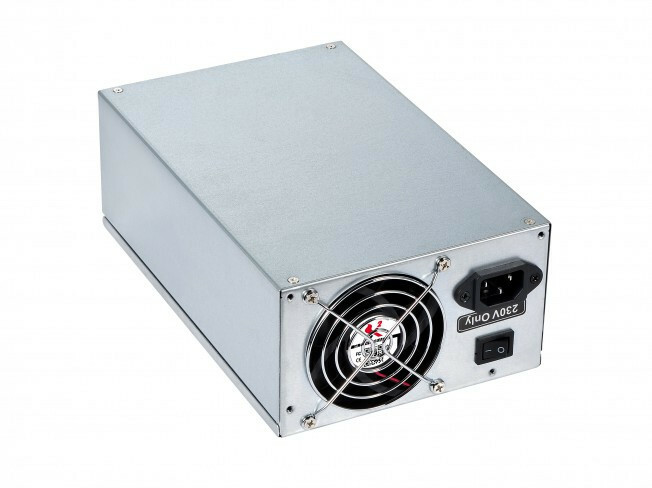 Under the hood, the Spire SP-ATX-2000W-BTC/ETH features a single +12V rail design with so-called "85 Plus Gold" efficiency; APFC, common electrical protection mechanisms against over/under-voltage, overload, short-circuit, and overheat. Two 80 mm fans (one on each end) are used to keep the unit cool. Taking into account its target audience, Spire is rating its life-expectancy at 100,000 hours, and is backing it with a 2-year warranty. It is priced at USD $219.99 a piece Stateside, or 199.95€ a piece in the EU. Currently, the company is only selling it on B2B platforms such as Alibaba, in 200-unit minimum orders. The room where you use this psu must have triple glazing windows in order not to wake up the neighbours. IMO it's a very good thing that some PSU manufacturers are starting to quote actual efficiency instead of just putting "80 Plus [metal]" on everything. The 80 Plus system was great when it was just 80 Plus, then it became a bit less intuitive when Bronze/Silver/Gold were added but still pretty obvious. However since Platinum/Titanium were added it's become an anti-intuitive mess that's worthless to the average user and just causes confusion. Proves how ineffecient making money with mining is. Mining is plenty efficient at making money. Power efficiency (especially if using this questionably rated PSU) is another matter that is quite subjective. Proves your knowledge of mining is inefficient for this thread. their "gold" is only ~bronze efficiency. nor is it given at what load that is to be expected - because it ALWAYS changes with load. Yeah but if manufacturers actually quote the efficiency on the box instead of some random metal then there is no need to look up charts online. It would work much better for the average user if all manufacturers did that. yeah, and send PSUs back to the dark ages when you didn't know if you bought a PSU or a flaming brick because you relied on marketing instead of a certification. because someone can't read a chart? you need to look back 10-15 years ago when there was so much crap in the market, then you'll understand why it is so horrible. those charts that seem so damned difficult to understand or look up, protect you from yourself among others. Yep, I rather gather empty bottles and cans. PSU quality has nothing to do with efficiency, I've seen many 80 Plus rated PSUs dead due to being cheap crap (Hi CiT), putting the efficiency on the box instead of a random metal would make it easier to understand for the average buyer. 85% Efficiency at half load. 88% Efficiency at half load. 90% Efficiency at half load. 92% Efficiency at half load. 94% Efficiency at half load. 96% Efficiency at half load. Obviously it's the second one, the 80 Plus system has always be confusing to the average buyer and that's only got worse over time due to additions to its non-intuitive design. */** I know these two are in the "wrong" order for the 80+ system, but as most users don't know the 80+ system I put them in the intuitive/expected order to emphasise the point. i didn't say anything about 80+ assuring quality, i am pointing out certification over what a manufacturer puts on their box. you may want to defend your horrible idea, even as you try to argue for the average joe, but history shows otherwise . ya know this isn't the first or second "85+ Gold" PSU, it was tried ~9 years years ago. btw, i am an average joe and understand the chart perfectly. There are Gold and even Platinum certified PSUs with low-quality caps (CapXon etc. ), I would never buy anything like that. Well, good luck with that in a money race.